Diane Benck’s call to action came during a Capitol Hill press conference where she was joined by a bipartisan group of lawmakers. 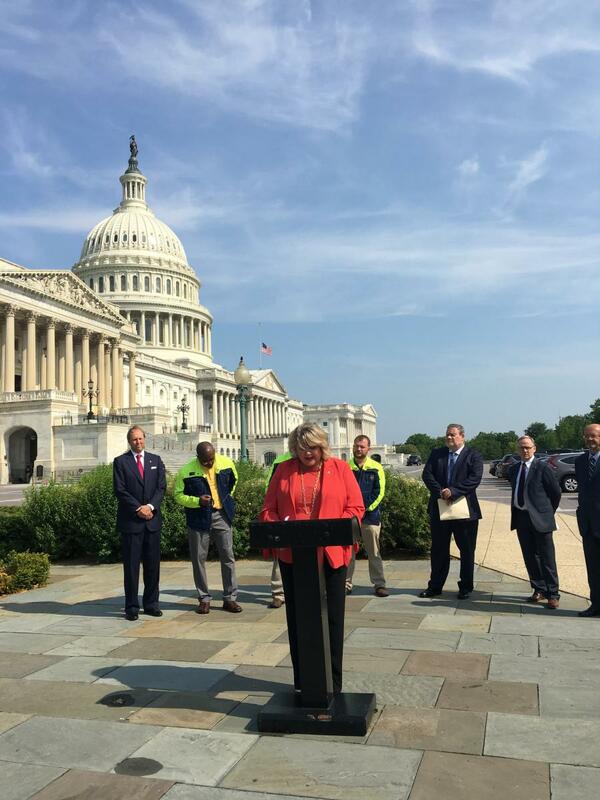 On May 15, 2018, on the grounds of the United States Capitol, AED's 2018 Chairwoman Diane Benck of West Side Tractor Sales Co. demanded congressional action to invest in the nation's crumbling infrastructure. Benck's call to action came during a Capitol Hill press conference where she was joined by a bipartisan group of lawmakers, including: Sen. Ben Cardin (D-Md.) and Reps. Garret Graves (R-La. ), Elizabeth Esty (D-Conn.) and Eleanor Holmes Norton (D-D.C.), as well as other senior construction industry leaders who participated. The event was organized by the Highway Materials Group, a coalition of trade associations representing companies that provide the materials and equipment essential to building America's roads, bridges, highways, airports and water infrastructure. AED is a leading member of the Highway Materials Group. With the federal Highway Trust Fund unable to support already inadequate investment levels and the nation's infrastructure in a state of disrepair, Benck called on Congress to assume its responsibility and turn words into action by working in a bipartisan manner to rebuild the country. Benck detailed the economic impact that the uncertainty surrounding federal infrastructure programs has on the construction equipment industry, as contractors are wary to invest in new machinery without greater confidence in long-term project funding. She also described the adverse impact that deficient infrastructure has directly on construction equipment dealers. As major users of the transportation network, AED members are plagued by congestion and insufficient highways, roads and bridges. The Trump administration released an infrastructure proposal earlier this year, placing the ball squarely in Congress' court to take action. AED will continue to pressure lawmakers to send a long-term infrastructure package that includes a solution to the Highway Trust Fund's pending insolvency to the president's desk before the end of the year. If you have any questions, please contact AED's Vice President of Government Affairs Daniel B. Fisher at dfisher@aednet.org. AED (Associated Equipment Distributors)infrastructureWest Side Tractor Sales Co, Inc.
AED (Associated Equipment Distributors) infrastructure West Side Tractor Sales Co, Inc.